Mevo Queens Wharf has three Mevos in permanent residence. Access is via Customhouse Quay. Uber: Use "Post Office Square" as your destination, then cross Jervois Quay at the lights. Walk: Simply follow the map in the Mevo app to get the fastest directions to the Pod. Exit onto Customhouse Quay either from the gates near the Pod. 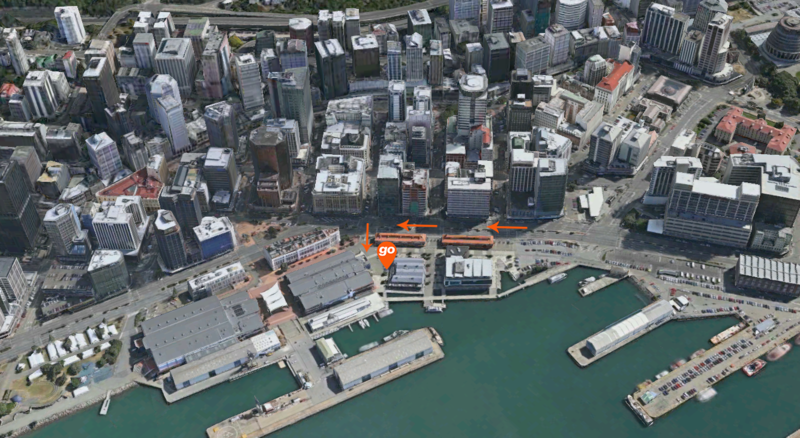 Access to the pod is via the gates near Cuckoo Bar, but only from the southbound lane of Customhouse Quay. If you're coming from the Taranaki St end of town, we find the easiest way to get into the southbound lane is to head north down Customhouse Quay, turn left at Warring Taylor St, left again onto Featherston and a final left onto Johnston Street. From there, you can turn right at the lights onto the leftmost lane of Customhouse Quay heading south and enter via the gates.